A few months ago, back when I did my troll blog-a-thon, I mentioned my longing for the elusive 1960s Marx Troll Village playset. I finally got one for my birthday: yay! The Marx Toy Company made all sorts of playsets like these back in the 1950s and '60s: western ranches, medieval castles, army forts, family farms, and pretty much any other imaginative setting a kid could want, complete with tiny figures, buildings, and a box or case that held all the parts. 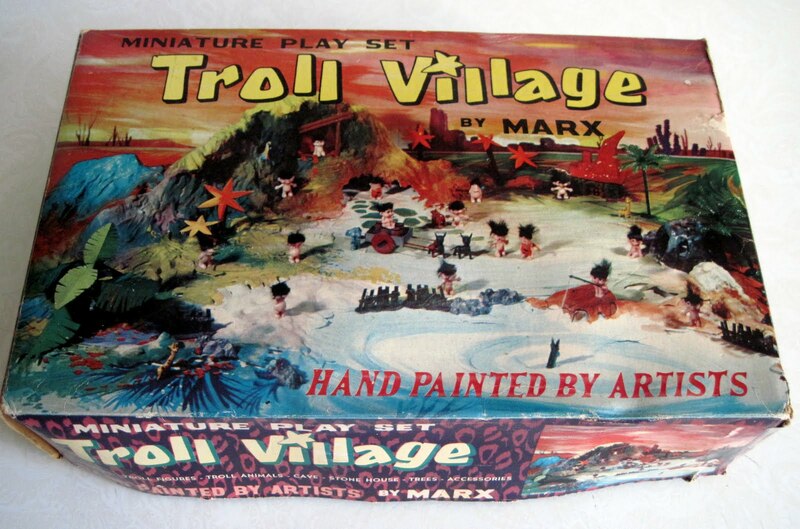 The Troll Village is one of their most unusual such sets, as well as one of their smallest. The box measures 10 inches wide, and the little trolls within are only 1 1/2 inches tall, the size of a typical gumball machine prize troll. 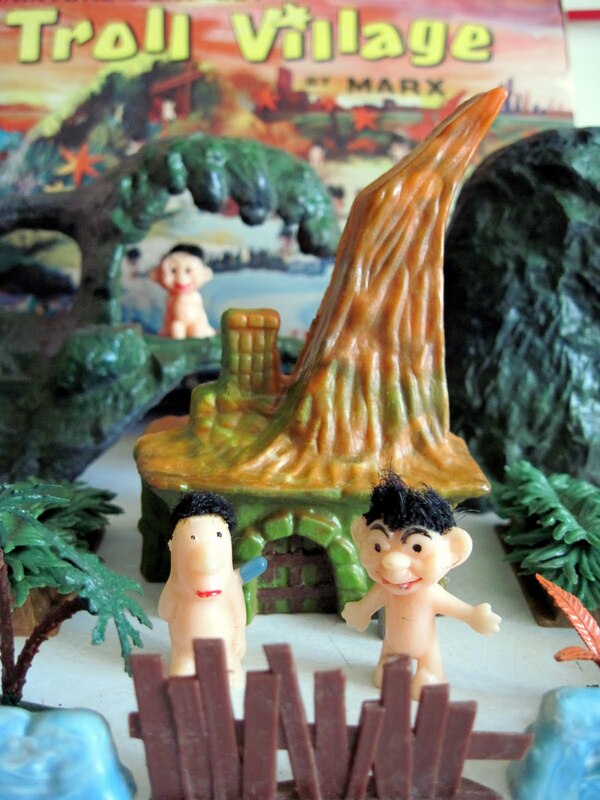 The set includes trolls, animals, fences, rocks, trees and foliage, a little house, and caves. Originally it also had a printed vinyl playmat, but this is often missing from the set, as it is with mine. Still, it's a fantastic toy for troll lovers, and no good troll collection can consider itself complete without one. out of scale with each other. 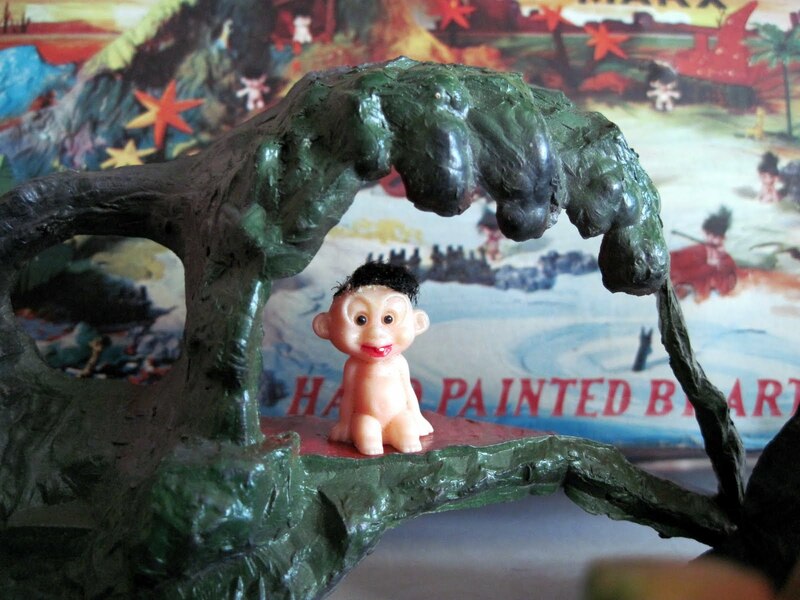 The little troll house is just 4 inches tall, with a crazy roofline. 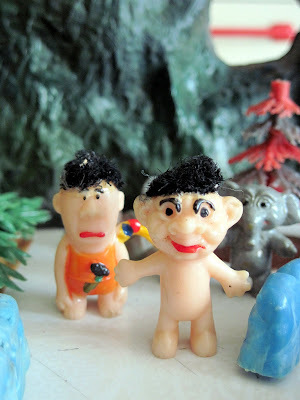 Two of Troll Village's denizens. the village is not officially a nudist colony. also made by Marx. 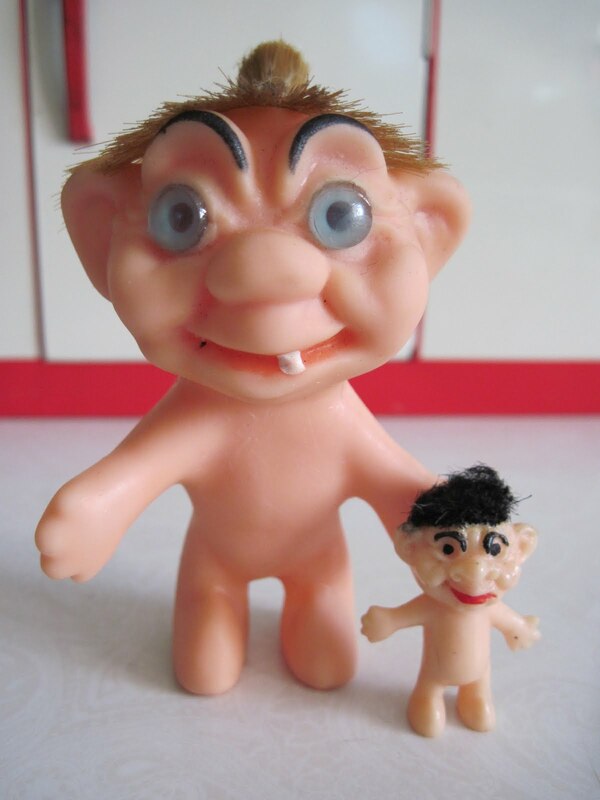 Their trolls have a very distinctive appearance. Most people get chocolates for their birthday - you get trolls!! I'm not sure what that means.... LOL You must have been so happy tho because I do remember you mentioning ages ago you were looking for that village. BTW do you think the big troll in the last pic has overdoesed on botox?? Hi Norma: either that, or he's been punched in the nose recently. I would like to ask for permission if I can add your blog to my Blogs I Am Following and on my List Of Links. Hello, welcome to the happy world of toy blogging! Absolutely, feel free to link away. Good luck with your blog! So this is where my little caveman-troll is from! Thanks so much for this info! Hi Matt, glad to have been of assistance. The Troll Village trolls are so cool, aren't they? Do they by chance have Hong Kong on the back side? I just saw your village! I remember asking for that one Christmas; my Mum had it hidden up high in her cupboard and I used to take it out and play with it. I was still excited Christmas morning even though it wasn't a surprise. What I wouldn't give to own that again! That is a great story: thanks for sharing it! 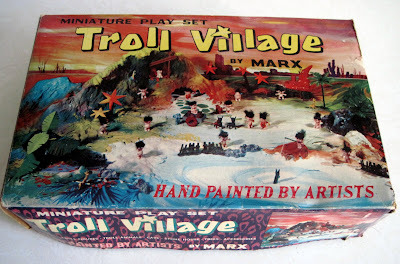 Since this posting, I've gotten a second Marx Troll Village, so this one is available if you're interested. I enjoy reuniting people with their long lost toys. Just let me know. 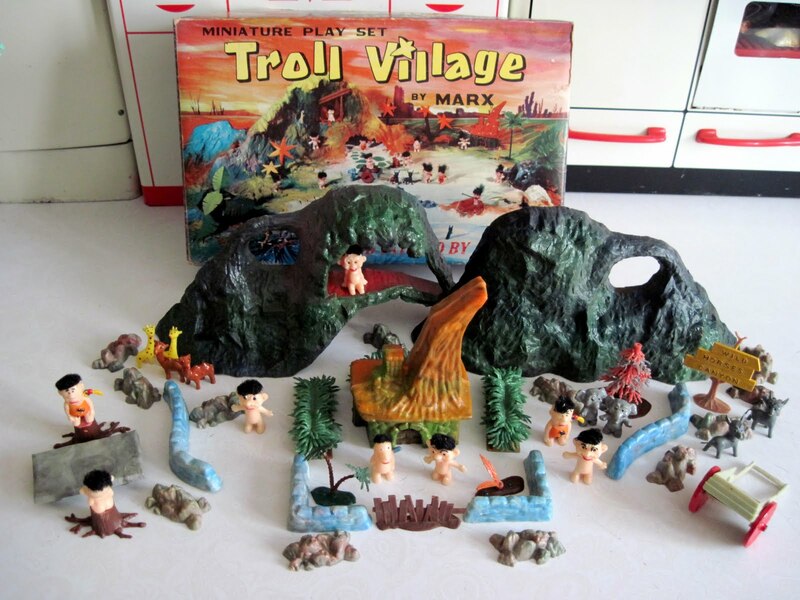 I do have a spare Troll Village (the one shown above). You can email me at spudbrain1(at) yahoo (dot) com if you're interested. I so envy you having this! I got this one Christmas years and years ago but it eventually fell prey to my two younger brothers. I would love to replace it! How much would you say it is worth??? We have one from my mom and are thinking of selling it.